Wired has said the Toyota i-ROAD could be the perfect electric vehicle, thanks to how it is being adopted in a trial which begins in Grenoble, France, in October. Toyota is part of a programme called Cité lib by Ha:Mo. Other partners include energy firm EDF – and its subsidiary SODETREL – which installs, manages and maintains electric charging points, and Cité lib, a well-established local car share operator. From 1 October, any Grenoble resident 18 or older who holds a valid driving licence can register with Cité lib, to gain access to the Toyota electric vehicles. People will be able to pick up a vehicle and drop it off at any of 27 charging stations in the greater Grenoble area. When the vehicle is dropped off, it is plugged into the station to be recharged and ready for the next customer. Wired points to this partnership as key to the i-ROAD’s appeal. It says the two biggest problems with electric vehicles are their limited range and high purchase cost. “Ha:Mo solves neither problem, but sidesteps both,” says Wired. “On a full battery, the i-Road can drive about three hours at a presumably limited speed. That’s actually excessive for vehicles meant to be used for a few minutes at a time and charged in between. 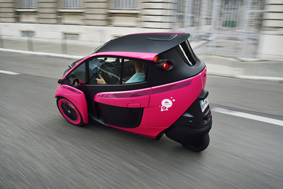 Read the full Wired article: France’s Bizarre Three-Wheeled Buggies May Be the Perfect EVs. The i-ROAD is part of a three-year pilot in Grenoble where the programme partners will gather data on technical issues and user behaviour to help shape future mobility initiatives.